There is never a good time for a pimple to appear. However, a pimple always seems to show up right before a big date, special occasion, or noteworthy event. No wonder toothpaste has long been used as an at-home remedy for this difficult-to-hide skincare problem. While many people have tried this quick fix approach, there are pros and cons to the treatment method. Cleansing the area with warm water and soap. Dry the skin with a clean towel. Leave it on for at least two hours. It may be kept on overnight for quick results, but people with sensitive skin should avoid this. Rinse with cold water to remove. If you notice any irritation, redness, or dryness, this method is likely too harsh for your skin. In this case, do not use toothpaste on your pimples and choose a different spot treatment instead. Toothpaste has long been touted as a natural solution, making it an inexpensive alternative to costly blemish remedies. There are pros and cons to all acne treatment methods. When it comes to toothpaste, there are several noteworthy reasons to consider using this remedy. Toothpaste is commonly used to treat pimples because of triclosan. This antibacterial ingredient is found in items like soap, deodorant, body wash, and of course, toothpaste. There are many benefits of triclosan. For instance, it is 99.6% effective at removing germs, which allows it to remove pimple-causing bacteria. Additionally, triclosan has been found to kill propionibacterium acnes (the bacteria that causes acne). Another benefit to this ingredient is its slow degradation time. Since it is not very water soluble, it stays on the skin longer, continuing to get rid of bacteria, even after you wash your face. There are many issues when it comes to pimples. Swelling, for instance, is a side effect that can make a blemish appear more prominent. Since certain toothpastes contain menthol or another type of cooling compound, it is often used to deal with swollen areas. In "Menthol and Related Cooling Compounds," a study published in The Journal of Pharmacy and Pharmacology, menthol was found to reduce swelling and enhance cold-receptor activity. That means the same ingredient that leaves you with a fresh, clean taste in your mouth works like ice on a pimple. Within minutes, swelling and inflammation may be noticeably reduced. There have long been links between calcium and acne, with research indicating that a high intake of dairy can elevate inflammation and lead to breakouts. However, calcium carbonate (an ingredient in many toothpastes, such as Colgate and Tom's of Maine) has been found to dry out blemishes. Though its purpose is to scrub the surface of the teeth without causing damage to the enamel, it can work on skin as well. Calcium carbonate removes excess oil from the affected area, clears out pores, and helps the skin return to normal. When it comes to skin care, convenience is always a factor. That is where toothpaste comes in handy. It is quick to use (you put it on and forget it), easy to apply (a simple dab is all you need), affordable (a Colgate Total Whitening Toothpaste Twin Pack is less than $5), and accessible (everyone has a tube of toothpaste on hand). The convenience factor alone makes it a popular choice in a pinch. This treatment method is fast, readily available, and effective. Just as there are advantages to using toothpaste on a blemish, there are disadvantages as well. They should be considered before making this your go-to acne remedy. While toothpaste can reduce swelling, there is another side effect to consider: redness. The ingredients that are effective at keeping teeth healthy and clean are not designed for use on the skin. 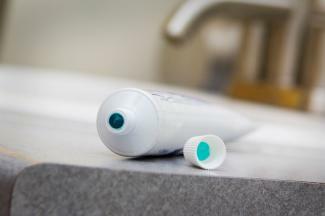 As a result, toothpaste may leave you with unsightly red marks. An article by Clearasil, "Save Your Skin: Don't Use Toothpaste On Pimples," stated that applying toothpaste to a blemish can actually lead to burns if it is left on for too long or if sensitive skin is an issue. Skin may also become inflamed if toothpaste is applied to an open blemish. Since breakouts are typically caused by a build up of excess oil, it stands to reason that drying out a pimple is a good thing. When it comes to toothpaste and acne, though, it is possible to over dry the skin. Most toothpastes have a combination of ingredients, such as hydrogen peroxide, baking soda, and triclosan. Each works well as a drying agent, but put together, they may cause problems for your skin. Excess dryness can lead to issues like inflammation, irritation, and flakes. A better solution might be salicylic acid or sulfur for targeted spot treatment. Certain ingredients destroy bacteria and work quickly to remove a pimple. There are however, drawbacks to relying on toothpaste. While calcium carbonate works well to dry out blemishes, it does not deal with the initial cause of the breakout. So, it is likely the pimple will return. Further, acne study "Anti-Acne Activity of Toothpaste - An Emerging Pimple Treatment," which tested five different toothpastes, found that this method only worked on white-headed pimples. Unfortunately, grabbing any old tube of toothpaste will not provide results. Only some toothpastes have been found to work effectively. In order to get rid of a pimple, the product must have ingredients like triclosan or calcium carbonate. It is also important that the toothpaste is plain white. Gels, colored pastes, and items designed to whiten teeth, have more chemicals in them. This can cause excessive drying and inflammation to occur. Crush aspirin and make a paste with water. Apply directly to the pimple. Put honey on a blemish overnight. This acts as a natural drying agent. Calamine lotion can be applied as an effective alternative to toothpaste. Combine tea tree oil with witch hazel and apply with a cotton ball. There are of course, store-bought face washes and acne treatments to choose from as well. Each is designed to minimize the size, redness, and lifespan of a pimple. Products with benzoyl peroxide, salicylic acid, and sulfur are most effective, as they speed up healing. A pimple is skin inflammation resulting from a clogged pore. It normally follows the formation of blackheads or whiteheads. There are numerous causes of pimples, including sweat, hormonal imbalances, diet, and the use of pore-clogging products. A pimple can last anywhere from a few days to a couple of weeks, depending on the severity. Cleansing the skin thoroughly before bed and first thing in the morning. Drinking at least eight glasses of water per day. Eating a healthy diet, full of fresh fruits and vegetables. Reducing stress from your everyday life. Despite the many ways to prevent pimples, they still show up every now and then. When time is of the essence, toothpaste may be an alternative to traditional spot treatments you want to consider. Everyone has a breakout at some point. When it comes to skin care, there are always options. Toothpaste has its advantages, as do other at-home and store bought treatment methods, but it may not work for everyone or in every situation. Experiment to find a solution that works for you and your skin.